I’ve been voraciously reading this year and trying my best to get through as many book books (as opposed to comic books) as possible. I’ve neglected books for a while in favourite of comics so it felt like a good year to shift my primary focus. I’ve missed reading and building a world put down for readers solely in words and it’s been refreshing to make time for the medium again. I’ve been enjoying a number of different types of books but I’ve definitely had a heavy focus on YA which have been doing a fantastic job of capturing my attention. I discovered Laini Taylor this year and fell in love with her writing. Strange the Dreamer is probably the one book on this list that is in a particular order. It consumed me in every way and I simply could not put the book down. Taylor’s writing is nothing short of exquisite and I’ve never read anything quite as beautiful as Taylor’s writing within Strange the Dreamer. I also got completely sucked into the Three Dark Crowns series and have been reading them faithfully as I can get my hands on them. Kendare Blake has put together a great series and has built a fascinating world. Sarah J. Maas is an author that I discovered last year. I have eagerly devoured her books (which are great fantasy series’ that have fantastic smutty bits…) and follow her works pretty closely now. Shrill is probably one of the only non-fiction books that I’ve read this year and if it had to be anything, I’m glad it was this one. Lindy West is nothing short of inspiring and absolutely amazing to me. I’m in awe of her as a feminist and as an overall human. What books have you been reading this year? What books are you hoping to get through? 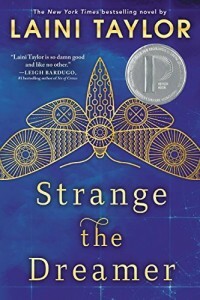 Muse of Nightmares is the sequel to Strange the DreamerGoodreads and is definitely next on my list to get through. The full list of everything I’ve read this year (and ever…) is over on , if you’re curious.